Ever dream of waking up with your favorite artist? 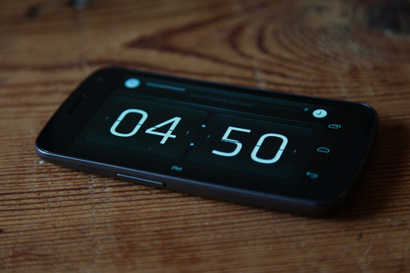 Now you can with doubleTwist Alarm Clock. Our latest gorgeous, intuitive and highly functional Android app is now available on Google Play. The Alarm Clock is just $0.99 for the first 10,000 customers. If you purchase by 04/05/12, and tweet about it or like us on Facebook, you will be automatically entered to win a fantastic designer clock by Biegert & Funk, worth $1100. Full details and rules are available at www.doubletwist.com/alarmclock/. 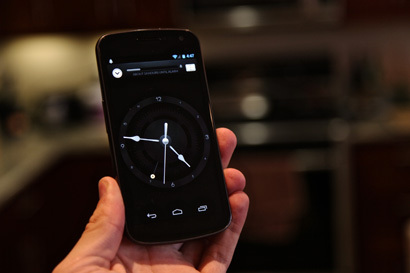 Two clock modes: flip clock and analog clock, includes nightstand dim mode. Set alarm through one of two modes: Time or Sleep Cycle. Sleep Cycle helps pick optimal wake-up times to correspond with sleep cycles. Set recurring alarms (weekdays, weekends, etc). Set a custom label for your alarms. 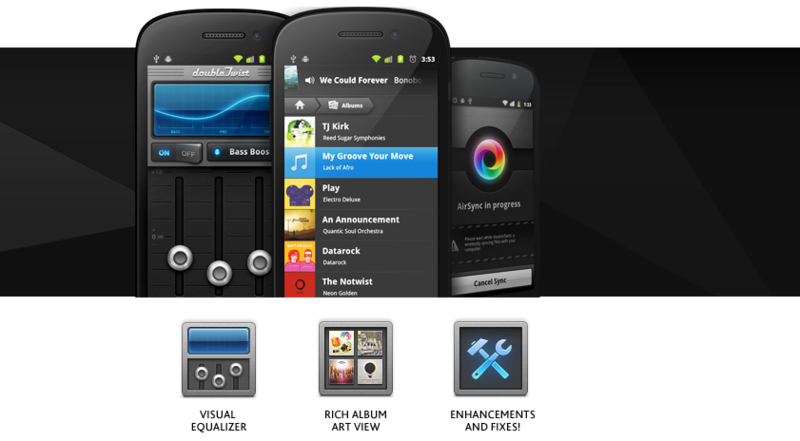 Choose from built-in alarm sounds or wake up to your favorite song or playlist (requires free doubleTwist Player app). View time pending until next scheduled alarm. Set snooze duration and alarm volume. We’ve just released an update making your favorite Android app sexier and slimmer. Added support for Google Music (offline tracks appear in library). Improved method for downloading alternate album artwork. Fixed AirPlay support for recent Apple TV update. Search is now more easily accessible. Get doubleTwist in the Play Store. 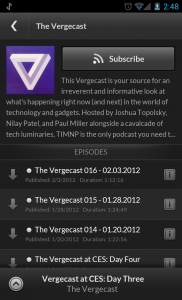 We’ve been working for several months to bring you the best podcast experience available on Android. 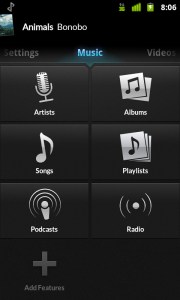 A whole universe of music, talk and video shows all from within your favorite Android app. Browse, play and subscribe to your favorite shows wirelessly from your Android, with no syncing or wires. 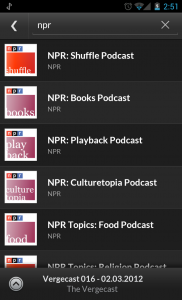 Search a huge directory of audio and video podcasts. 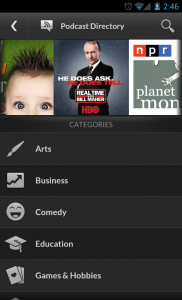 Browse by category (such as Music, Comedy, News and Sports). 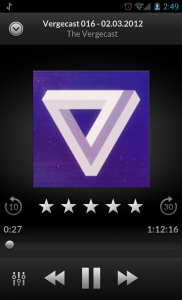 Stream or download individual episodes. Subscribe and manage your feeds. Resumes playback from where you left off. 10 second back and 30 second skip playback controls. 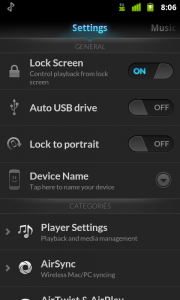 Smart download settings to conserve battery and bandwidth. doubleTwist Podcasts is now available as an in-app upgrade and as part of the newly offered doubleTwist Pro that unlocks all of the premium doubleTwist features (AirSync, AirPlay, EQ, hi-res album art downloads and wireless podcasts). 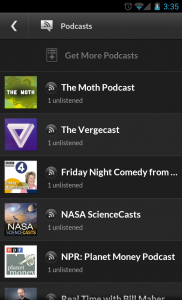 Browsing/searching the directory and streaming podcasts is available for free to all users. We’re very excited to announce the next major version of doubleTwist for Android. It’s available now in the Android Market and will be available in the Amazon Appstore later this week. A new homescreen design that’s easier to navigate as we continue to add new features. 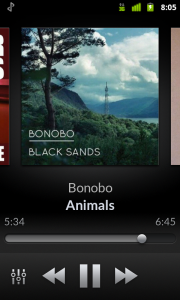 The playback screen now features a sneak peek cover view – enabling you to slide to see the previous or upcoming track. Re-designed settings with better grouping. At doubleTwist we believe everything should be polished, even the settings. An option to choose which memory location (internal vs. external) should be used for AirSync. 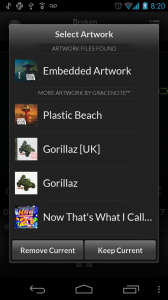 A new grid view for albums that shows off your music’s beautiful cover art. 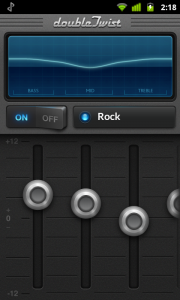 A premium equalizer for users running Android 2.3 or higher. AirPlay video support for latest Apple TV 2 software update. When we released the first version of doubleTwist for Android 18 months ago, we set the bar for delivering an awesome user experience on Android. With this new release, we’ve raised the bar to a whole new level. We don’t like to rest on our laurels though, so expect another major release in December that will blow your mind!